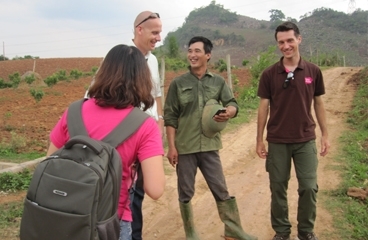 Tuoi working in the field. From our beginning in 2006, we have been passionate about assisting our clients to improve their business results in a sustainable way. Our people are not hesitant about using their experience and sharing their insights. This often results in lively interaction, and inspirational outcomes. Our personnel are consultants, agronomists, project managers, marketeers, business analysts and support staff. They come from far and wide, and work in multicultural, multidisciplinary teams, more often than not including our clients. Our network in Asia and Europe enables us easy access to strategic alliances with partners in research and development. We have four office locations - in Hanoi, Ho Chi Minh City, Dalat and Can Tho. Our R&D farm is located in Dalat, and we have a marketing representative in Manila, Philippines. Our projects are executed on location. We offer our services in Southeast Asia and Europe. Watch our team at work !